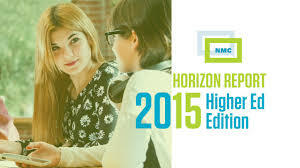 New Media Consortium (NMC) Horizon Project reports on key trends, significant challenges, and developments in educational technology seem to be bursting beyond the boundaries of their virtual covers in spectacular ways, as the release of the 2015 Higher Education Edition this week makes abundantly clear. There was a time when reading these free online training-teaching-learning resources involved little more than downloading the documents, taking a couple of hours to absorb the content, and then following a few selected links to learn more about the topics covered. Then the ever-increasing amount of content included within the reports created a need for a video synopsis posted on the New Media Consortium YouTube channel; the lavishly-produced and well-paced 2015 Higher Education Edition video clocks in at nearly seven minutes (compared to just under four minutes for the 2014 Higher Education Edition video). A very helpful infographic that further synthesizes the report through a single well-designed image for those who want to quickly grasp the high points of the report. A chart on page 35 of the report mirrors the online resource that lists the more than 50 technologies followed through the Horizon Project—a great gateway for anyone interested in exploring individual technologies they haven’t yet encountered. Increasingly numerous resources available through endnotes—nearly 300 spread over two pages near the final pages of the latest report—offer information-hungry readers a chance to explore the topics in greater depth. And the usual access to report expert-panel discussions within a well-facilitated wiki make the process of producing the report as transparent as possible while also providing an educational-technology resource unlike any others currently available online. The results are stimulating discussions of six key trends, six key challenges, and six technological developments expected to “inform policy, leadership, and practice at all levels impacting universities and colleges” in ways that have repercussions for any of us involved in training-teaching-learning within the ever-expanding lifelong learning landscape we inhabit. Key challenges impeding technology adoption in higher education within the short-term horizon include “blending formal and informal learning” and “improving digital literacy.” Mid-horizon challenges include those posed by “personalized learning” and “teaching complex thinking.” The “wicked” challenges—those “that are complex to even define, much less address”—include addressing “competing models of education” and finding ways to effectively reward teaching. Important developments in educational technology for higher education in one year or less include the “bring your own device (BYOD)” movement and, for the second consecutive year, the flipped classroom model. Makerspaces and wearable technology are placed in a two- to three-year time-to-adoption horizon. 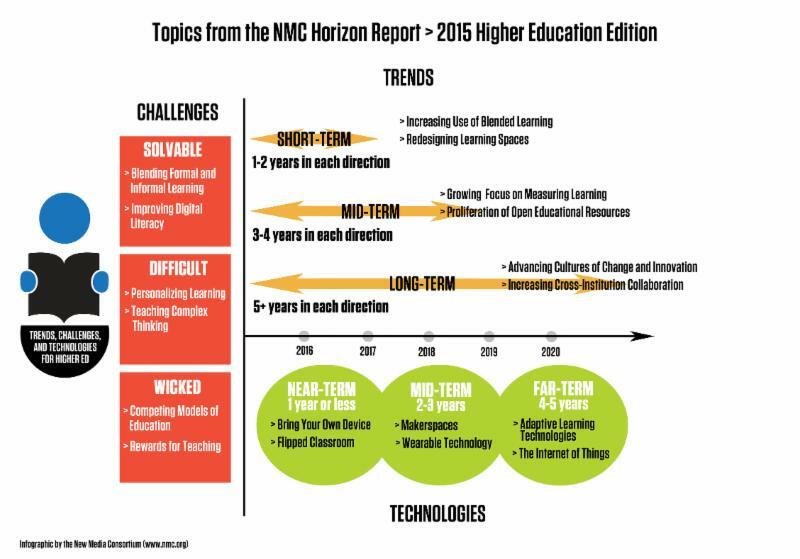 “Adaptive learning technologies” joins “the Internet of Things” in the four- to five-year horizon. What all of this means to those of us engaged in lifelong learning efforts will be explored more deeply in the remaining articles in this series of posts. In the meantime, those interested in playing a more active role in the Horizon Report process that many of us currently treasure are encouraged to complete the online application form. This entry was posted on Friday, February 13th, 2015 at 4:28 pm and is filed under technology, training. You can follow any responses to this entry through the RSS 2.0 feed. You can leave a response, or trackback from your own site.